Christmas and New Year's are soon upon us. A happy and joyous holiday to all! We are pleased to have Katherine Tilton back to present "THE ARTY T" Seminar. If you could not attend the September event, now is your chance. If you did attend the previous seminar, you won't want to miss this evening as Katherine has recently returned from Paris with all new ideas and inspirations. This event is co-sponsored by the Textile Center of Minnesota http://www.textilecentermn.org/. Made from scratch or purchased Ts are a sewers ideal blank canvas. Let Katherine help you see the possibilities in a humble T with a designer’s eye. Straight from her limited production design studio comes a gold mine of information on how to incorporate easy sewing and surface design techniques. In addition to a gallery of Arty T-shirts, you will see up close how-tos including slashing, inset, innovative edges, combining two Ts to make one, along with adding the punch of paint, foil and discharge. Your DIY Arty T will look as if you found it in an expensive little boutique in Florence, Paris, New York or San Francisco. Katherine will also present a trunk show of her newest work: jackets, vests, T-shirts and pants. 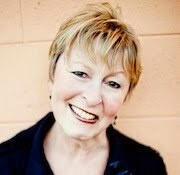 Katherine Tilton brings a light-hearted clarity, simplicity and sense of deep play to all she touches. A woman of many talents, she maintains creative studios in southwestern Oregon and St. Paul. She and her sister, Marcy, conduct studio design tours to Paris and San Francisco, exploring and playing in the creative essence of those magical cities. 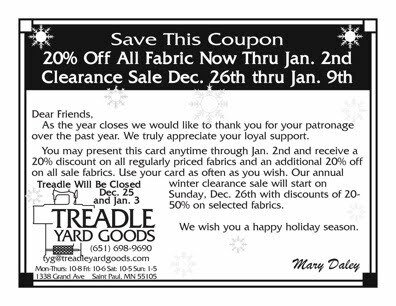 Due to the blizzard Treadle will be closed today. We hope you will be cozy wherever you are. We saw the opening day of our inaugural Treadlette Gift and Accessory sale yesterday, and I have to tell you, we have some amazing things for sale! There is much, much more. Come and see how talented my co-workers are! Also, we have a basket for Toys for Tots in the store. The deadline to bring in a new, unwrapped toy is December 15th. Let's make everyone's holiday a great one!